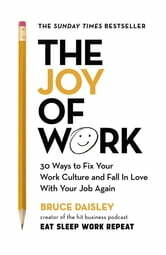 From the creator of hit podcast Eat Sleep Work Repeat comes a revolutionary re-envisioning of how to enjoy your job. In the course of a career that has taken him from some of the world's biggest media companies to Twitter, via Google and YouTube, Bruce Daisley has become fascinated by what makes great companies tick. And in his hugely popular podcast Eat Sleep Work Repeat, he has dug right into the DNA of work, talking to leading experts about how we can make our jobs more fulfilling, more productive – and much more enjoyable.